Two entrances close to each other. Moons Bridge Marina is a minor waterways place minor waterways place place on the waterways major waterways place village town city on the Lancaster Canal (Main Line) between Ribble Link - Lancaster Canal Junction (7 miles and 2¼ furlongs to the south) and Lodge Hill Junction (Junction with Lancaster Canal - Glasson Dock Branch) (15 miles and 2¾ furlongs to the north). 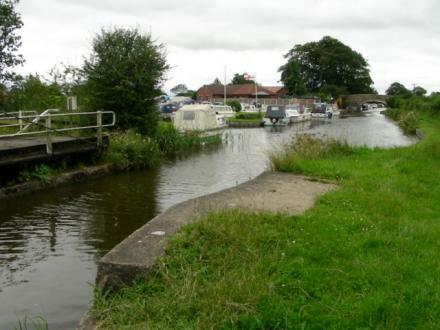 The nearest place in the direction of Ribble Link - Lancaster Canal Junction is Moons Bridge No 36; ½ furlongs away. The nearest place in the direction of Lodge Hill Junction is Hollowforth Swing Bridge; ¼ furlongs away. Preston — 1164 yards to the south. Dale Cottage, Newsham Hall Lane, Woodplumpton., Preston, PR4 0AS — 1248 yards to the southeast. 4 Plumpton Field, Woodplumpton, Preston, PR4 0LN — 1591 yards to the south. Woodplumpton, Preston, PR4 0BA — 1125 yards to the south. 588 Garstang Road, Preston, PR3 5DP — 1582 yards to the east. 637 Garstang Road, Preston, PR3 5DQ — 1512 yards to the east. Moorside House Farm, Woodplumpton, Preston, PR4 0TB — 930 yards to the west. Threlfalls Farm, Newsham Hall Lane, Woodplumpton, Preston, PR4 0AS — 1605 yards to the southeast. Barton, PR3 5DD — 1619 yards to the east. Boggart House Farm, Station Lane, Barton, Preston, PR3 5DY — 985 yards to the east. Hollowforth lane, Woodplumpton, Preston, PR4 0BD — 69 yards to the south. Preston, PR4 0NH — 1481 yards to the south. Barton — 1619 yards to the east. Woodplumpton — 971 yards to the west. PR4 0 — 1405 yards to the north. 639 Garstang Road, Preston, PR35DQ — 1537 yards to the east. Woodplumpton, Preston, PR4 0TA — 638 yards to the southwest. Catterall Lane Catterall Preston, Garstang, PR3 0PJ — 1010 yards to the east. Newsham Hall Lane, Woodplumpton, Preston, PR4 0AS — 1251 yards to the southeast. Alder Grove, Woodplumpton, PR2 7BX — 1353 yards to the south. Barton Brook Dairy, Station Lane, Barton, Preston, PR3 5DY — 1030 yards to the east. Preston, PR4 0T — 939 yards to the southwest. Harbour Farm, Woodplumpton, PR4 — 1353 yards to the south. Anderton Fold Farm, Garstang Road, Barton, PR3 5AD — 1619 yards to the east. 94 Woodplumpton Road, Preston — 1310 yards to the south. Honeywell, Eaves Lane, Woodplumpton, Preston, PR4 0BH — 1289 yards to the northwest. Greenside, Woodplumpton, PR4 0 — 1353 yards to the south. Black Pole Farm, Lewth Lane, Woodplumpton, Preston, PR4 0TD — 1604 yards to the west. 1353 yards to the south.